…to this; with SI Precast Parking Curbs. Our concrete parking blocks are air entrained to prevent cracking. 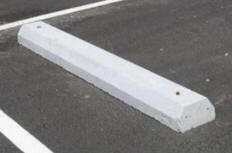 Our parking curbs are manufactured with 5,000# psi concrete and reinforced with steel rebar. They are also cast with holes for steel anchors and slots underneath for drainage. Available in 6′ or 7′ curbs. Also available: Tuf-Stop parking curbs from Tuf-Tite. Visit our Resource Center for shop drawings of concrete parking stops and other products and a downloadable Product Catalog.